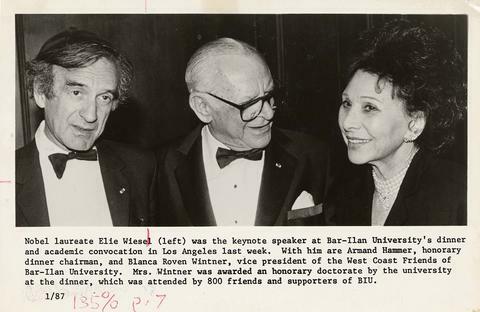 1 photograph : b&w print ; 5.5" x 8.25"
Photograph depicts (l-r) Elie Wiesel, Armand Hammer, and Blanca Roven Wintner at a Bar-Illan University convocation. 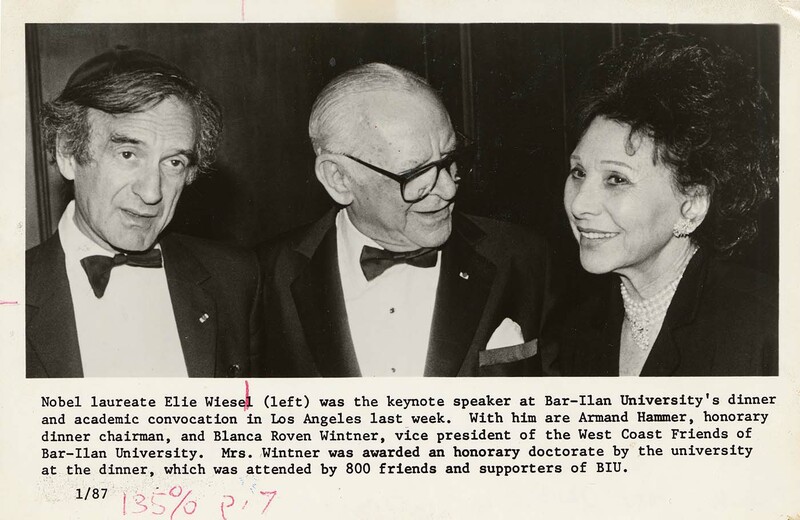 Caption: "Nobel laureate Elie Wiesel (left) was the keynote speaker at Bar-Ilan University's dinner and academic convocation in Los Angeles last week. With him are Armand Hammer, honorary dinner chairman, and Blanca Roven Wintner, vice president of the West Coast Friends of Bar-Ilan University. Mrs. Wintner was awarded an honorary doctorate by the university at the dinner, which was attended by 800 friends and supporters of BIU. 1/87." Written on verso: Feb. 16, 1989 JWB.